Vision ENG tripods are precision-engineered with single or two-stage legs, and made of aluminum alloy or carbon fiber material. Offers a 100mm-bowl fixing, attached to an innovative hip joint that eliminates play and gives more rigidity to provide an exceptionally stable camera platform. With unrivalled height range capability and Pozi-Loc leg clamping system, these lightweight, compact tripods are quick and easy to set up and provide excellent operational flexibility. Constructed of strong carbon fiber, to provide the sturdiest and most durable material for demanding applications. Tripod rigidity is a vital factor in achieving smooth camera movement and first class picture quality. 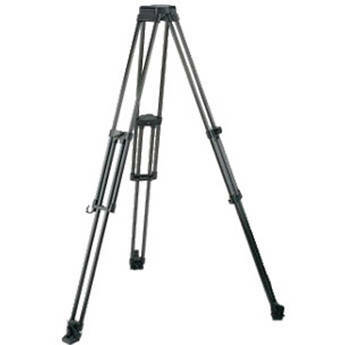 The Vision range of tripods are unique in giving maximum torsional rigidity throughout the height range by combining a "perfect" triangular structure with the most innovative design features. The new Pozi-Loc is Vinten's innovative cam-operated clamping system, ensures tripod reliability and safety and its positive action shows clearly when the tripod is locked. Supports up to 55.1 lb. Box Dimensions (LxWxH) 33.5 x 7.0 x 7.0"